Neuropathic pain is an umbrella term, with everything from chronic pain caused by injury to a change in the nerves falling underneath it. Symptoms can be wide-ranging, too, such as peripheral neuropathy like numbness or tingling to a sharp, stabbing pain like carpal tunnel syndrome. This generally depends on where on the body the pain is as it can alter both the severity and the symptoms. 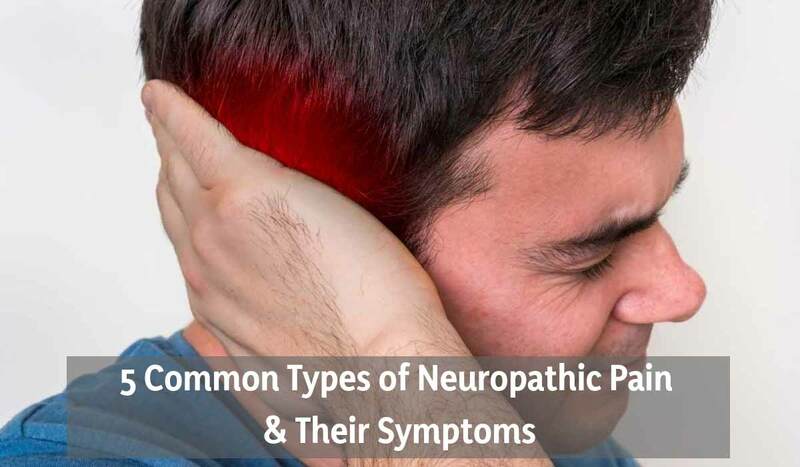 Here are the most common types of neuropathic pain and the symptoms that come with them. Perhaps one of the most commonly known neuropathic pain conditions is carpal tunnel syndrome,which is when a pinched nerve inside the wrist creates tingling and numbness in the hand or wrist. Also known as median nerve compression, it is extremely common. Because it can be caused by repetitive movement, a lot of people suffer from it. However, other things can cause carpal tunnel syndrome, such as pregnancy, diabetes, some types of arthritis, hypothyroidism, and many other ailments. When it comes to treatment, it depends on what is causing the carpal tunnel in the first place. If it’s being caused by another condition and therefore a symptom of another disease such as diabetes, then addressing the initial condition is the only way to go. Once that condition is treated or under control, it’s very likely that the carpel tunnel will fade away by itself. In some cases, however, surgery may be the best option. The key here is addressing the problem as soon as possible in order to catch it early on. Radiating pain that starts in the lower back or the pelvic area and shoots itself down into one or both legs is known as sciatica. And it’s more common than you may think. With over 3 million people being diagnosed in the United States annually alone, a lot of people are suffering from it across the globe. Because the sciatic nerve is by far one of the biggest nerves in the body, sciatica can be caused by a lot of different problems. This could include a problem with the spinal disc, an injury that occurs in the pelvic area, or spinal stenosis. When it comes to treatment, the sooner you get it looked at, the better. Uncovering any underlying issues or causes is key as well. Once those issues are addressed, you may find the problems go away on their own. You can also try a natural remedy for pain relief, as it is a simple way to address the problem without the harshness of medications or other medical procedures. If you’re suffering from diabetes, you’ve likely heard of diabetic neuropathy. This condition can happen when there are high blood sugar levels over and over and over again. There are four different kinds of diabetic neuropathy conditions: focal, proximal, peripheral, and autonomic. When it comes to the most common type of diabetic neuropathy, it’s peripheral. While it mostly affects the hands and feet, it can spread to other parts of the body as well. Pain includes tingling, numbness, and burning sensations. Needless to say, the best way to tackle this neuropathy is by addressing diabetes first. Getting your blood sugar levels under control by working with your doctor is the best option for minimizing your pain. Stroke, tumors, epilepsy, Parkinson’s disease, brain or spinal cord trauma, or multiple sclerosis can all lead to central pain syndrome. One thing is for sure—the symptoms associated with central pain syndrome is almost always constant. The severity can range from moderate to very severe. In fact, a lot of things can factor into the pain. For example, movement, touch, temperature, and, surprisingly, emotions can sometimes make the symptoms worse. This makes it difficult, as these factors are tough to control, especially emotions. Who would think temperature could affect your nerves so severely? However, anyone suffering from CPS will be the first to tell you that these elements—touch, movement, temperature, and emotions—truly do have a hand in their pain. Because it directly affects the central nervous system, it can be difficult to treat and manage the pain. A natural remedy to address the pain and help the nerves get back up and functioning can be beneficial when it comes to CPS. Also, addressing the initial condition that could be causing CPS can help get it under control. Haven’t heard of this condition? You’ve likely heard another name for it: shingles. It is commonly believed to only affect people 50 and older; however, it can affect anyone who has had the chickenpox. Shingles happens when the chickenpox virus reactivates in a person. Shingles is a serious condition by itself, yet even after it has cleared up, many people struggle with pain. The leftover complications and pain is postherpetic neuralgia. Even though it doesn’t last a lifetime, it certainly feels like it to a person. Lingering pain, numbness, and other neuropathic symptoms can persist for months. Luckily, there are plenty of options available, ranging from oral to topical medications. Your best bet is to talk to your doctor about pain management. One option for most types of neuropathy is Nerve Renew, named one of the best neuropathy supplements of the year. When you’re dealing with the feeling of pins and needles, burning, numbness, or a loss of sensation, Nerve Renew can help. As a proprietary blend of natural remedies, it’s bursting full of vitamin B2, vitamin B6, vitamin D, oat straw extract, passion flower, and skullcap extract. Backed by over 20 clinical studies, you’ll find this natural remedy helps cut back on your symptoms and can even promote the regeneration of degenerating nerves. Other treatments can be discussed with your medical provider. Neuropathy treatment tends to include nerve stimulation therapy, physical therapy, and other types of therapies, medications, and prescriptions. As with most medical ailments, the kind of approach depends on your individual situation. However, if you want to try a natural approach before diving into medical prescriptions and medications, Nerve Renew is a great alternative. It doesn’t just deal with the pain—it focuses on getting your nerves back to normal and keeping them healthy and robust.